For individuals that need help getting into a tub to take a shower or bath, a bathtub transfer bench is a great solution to make this process as easy and seamless as possible. The way it works is an individual sits at the end of the transfer bench positioned on the outside of the bathtub. Then, the individual swings their legs over the lip of the tub, centering themselves on the bench, which means that they do not actually have to climb over the edge of the tub to get in. They can then gently scoot over to access the interior of the tub. 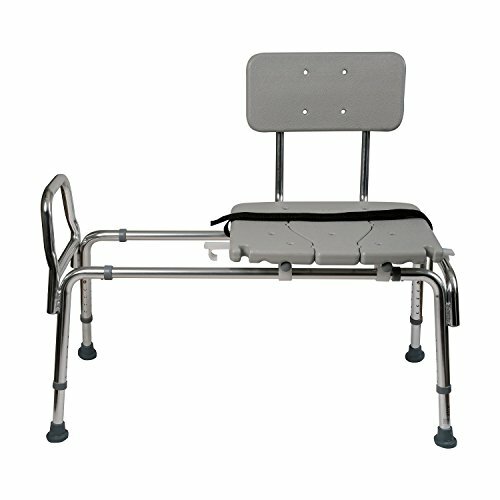 The Platinum Health transfer bench is a sturdy option that has received raving feedback from its users. It provides a functional and simplified means for debilitated users to take a shower, enabling many buyers to shower safely without assistance. Users say that it is easy to swivel and slide, unlike other transfer benches that can be a hassle to manipulate. Another interesting feature is Platinum Health's high-contrast color design which is engineered so that important parts of the chair are more easily recognized by users with vision problems or dementia- decreasing incidence of slips and falls. Let's take a look at some of our favorites. What are customers saying about shower transfer benches? 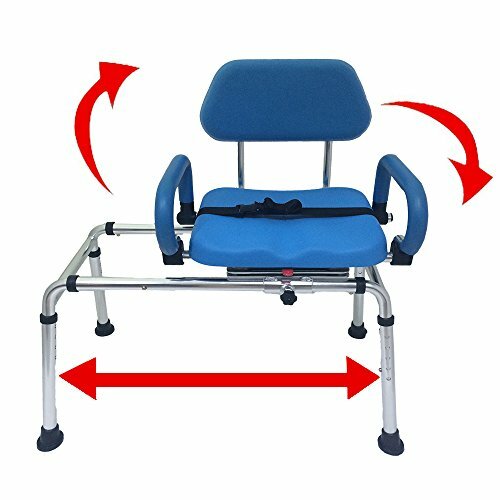 ​While the majority of users seem satisfied with the security and stability of this transfer bench, some said that the cushions can degrade over time, exposing bones to painful pressure. In addition, some users complained that the bench didn't reach far enough towards the tub wall, leaving them 'off-center' while showering. One popular, non-padded option is the Platinum Health. This blue sliding transfer bench is designed for people with mobility challenges who weigh 330 pounds or less. It effectively enables individuals to slide in and out of the tub safely and easily. The swivel-seat has slip-resistant padding and comes with padded back and armrests. Unlike standard benches with fixed armrests, this bench’s armrests can be raised or lowered and locked into place. The aluminum, rust-free legs can also be easily adjusted from 19” to 23.5”. The overall horizontal travel of the seat is 12”. Moreover, the adjustable width of the armrest is 17” and the distance between the armrests measures 19”. A seatbelt completes the set. Great for users who are up to 400 pounds, this blow-molded plastic bench with backrest is reversible and works in most bathrooms. It sits on top of an A-frame sturdy construction for stability. The seat depth and width measure 18.5-19.5 inches and 26 inches, respectively. The legs have large suction cups that lock to keep it in place. The height of the legs from the floor can be adjusted from 17.5 to 21.5 inches, with half-inch increments. It requires no tool for assembly. With solid user feedback, this reversible transfer bench is a good buy. It has a strong construction with an anodized aluminum frame and textured blow-molded seat and backrest. It is lightweight and can easily be assembled in minutes. Although a bit hard because it is not padded, the seat allows users to easily slide out of it. It is safe to use if you weigh 300 pounds or less. It is designed to fit well on a standard tub. The orientation of the seat and backrest can be changed as needed. The legs have an adjustable height of 15.5″ to 19.5″ and feature two suction tips for stability. The seat measures 25.5″ in width and 18-19″ in depth. 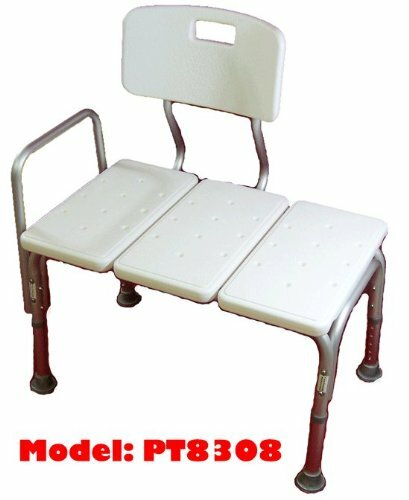 Transfer from a wheelchair or walker to the bath is easier with the help of this bench. This product minimizes back strain while adding flexibility and comfort for the user. With its durable and lightweight aluminum frame, it can be easily lifted and moved. The whole set comes with a textured non-slip seat and backrest and a nylon strap that keeps the seat in place. It can support a person weighing 400 pounds. The seat height can be adjusted from 19 to 23 inches with one-inch increments while the seat size is 19 by 14 inches. The whole bench measures 39 inches across. 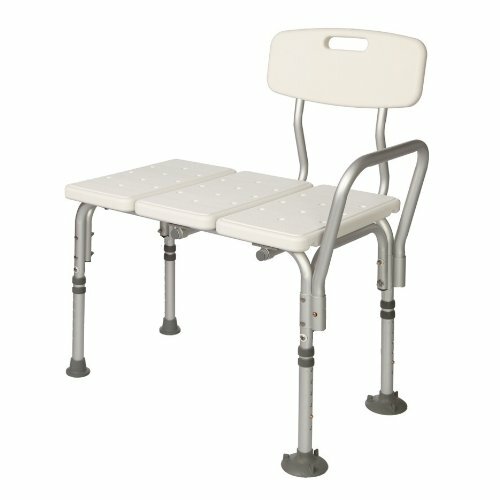 Patients with mobility challenges will find this transfer bench helpful for transferring from a wheelchair to a bath seat. With many users providing feedback, it has scored pretty solid ratings, with many buyers happy with its ergonomic design. This bench allows for 5 levels of seat adjustments from 16.5 to 20.5 inches, with one-inch increments. The backrest can be adjusted to suit a left- or right-handed user. The seat measures 24 by 15 inches, giving the user enough space to sit on. The overall dimensions of the frame are 29 inches (L), 16 inches (D) and 25 inches (H, without backrest). Its weight capacity is up to 250 pounds. Customers enjoy watching their elderly relatives glide into the shower by themselves. Shower transfer benches enable you or a loved one to regain some autonomy, privacy (with added safety) in the bathroom. The suction cup feet that go in the tub or shower itself provide strong stability while users transition into the bathing area. The bench legs typically adjust independently which allows you to compensate for differences in height between the floor and the bottom of the tub. Users note that it sometimes takes a little time to get the hang of using one of these bathroom aids, but after a couple of tries people get the hang of it and figure out the best way to use it. If your tub wall height is particularly high, it probably makes sense to take some measurements to ensure that the transfer bench will meet the minimum clearance requirements. 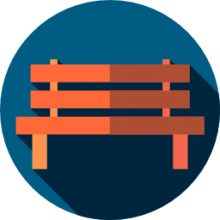 Users enjoy that the majority of transfer benches do not require any tools to assemble. Some users do note that the suction cups are pretty strong, so it can be a bit of a hassle to unstick the transfer bench when it is not in use or if another individual is going to use the shower without the aid of a transfer bench. Some users note that transfer benches and their shower curtains are not always compatible. You will have to see for yourself how best to deal with this issue. You might have to arrange the shower curtain outside the lip of the tub once the bather is inside. This was considered only a minor trade off. Many users were happy that they went online to find a transfer bench, as their local medical supply stores oftentimes had outdated transfer benches. Before you make your purchase, make sure to do your research regarding the specific product requirements for you or your loved one. Get a sense of what warrantees are available. In the event that you will have to return your item, it’s good to know when advance what your options are. Bathrooms can be dangerous places for the elderly. They contain many sharp corners as well as hard surfaces. The National Aging in Place Counsel has some interesting recommendations to make your bathrooms more safe for the elderly. When it comes to the shower, they do recommend installing a shower stall without a barrier. This would eliminate the requirement of the elderly to step over the edge of the tub to access the shower. As well, they also recommend using handheld showerheads as well as grab bars. For the sink, they recommend lowering it so that there is enough need clearance for comfortable maneuvering. For the toilet, it is recommended to install an elevated toilet seat- this will make it easier for the elderly to get up and down. As we have already covered the benefits and utilities of shower transfer benches, we don’t need to rehash the topic too much except to say that they are an easy way to help make the bathroom safer for the elderly. It is also advisable to install a hand-held shower head. Toilet risers are also readily available and not too expensive. Grab bars are another great option as well as nonskid mats that can help make bathroom services less slippery. You could also install a phone inside of the bathroom for emergency use. A portable toilet is also another option for the elderly to use in the bedroom. This would help prevent them from having to go to the bathroom late at night. Research by the CDC has indicated that individuals aged between 75 and 85 are twice as likely to suffer nonfatal injury in the bathroom. This is why prevention is so crucial if you are responsible for caring for an elderly person. Making some of the modifications that we listed above is a great start. Perhaps the greatest preventative solution is just to have somebody around to help look after the senior in your life. That person could be a friend or even a home care professional-B will be able to dramatically reduce the risk of injury in the bathroom.